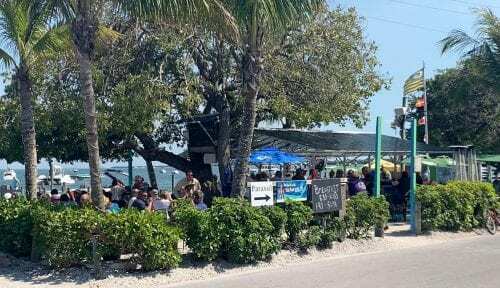 ANNA MARIA ISLAND – Anna Maria Island beaches are busy and business owners are enjoying a banner Spring break season. 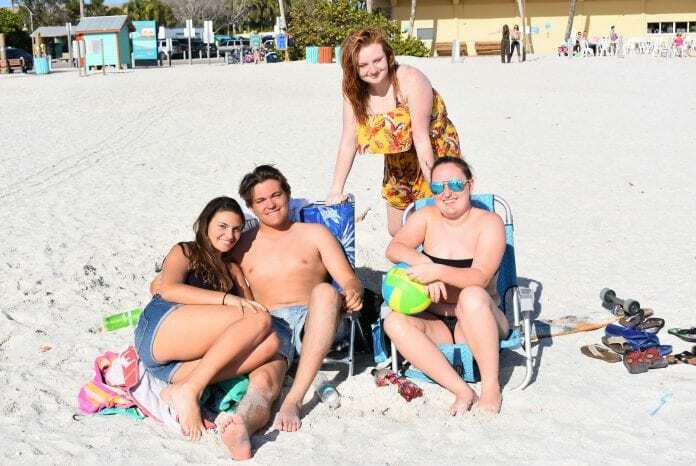 A mid-week visit to Manatee Beach in Holmes Beach found a quartet of students from Indianapolis among those enjoying a beautiful beach day. “We have family that lives down here. It’s a clean beach, the sand feels great and the water’s clean,” said high school senior Brenna Garrard, while sitting on the beach Wednesday afternoon with her twin brother Tyler and their high school friends Alexis Weston and Samara Gephart. Tyler graduated high school early and is now studying mechanics as a freshman at Indiana University. 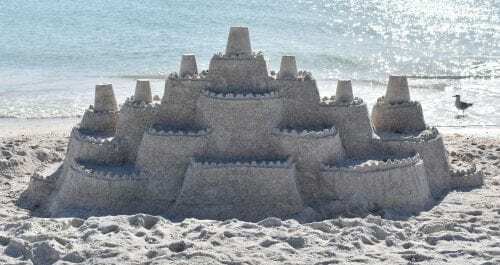 “We went over to Siesta Key and we’ve been in Clearwater a few times. I like this beach a lot better. Clearwater is more packed. Here it’s more relaxed,” Tyler said. On Friday, Holmes Beach Police Chief Bill Tokajer said, “People have been behaving very well. Most of our guests have been families that have had a wonderful time on the Island. We had two groups of unruly college students that were evicted from their rental units for underage drinking, jumping off the roof into the pool and other things they shouldn’t have been doing. The rental agents were notified and they evicted them. “We’ve also had many well-behaved and respectful groups of college kids on the Island from Ohio, Minnesota, a group from Indianapolis and a couple groups from Tampa. We enjoy having the groups that respect our rules and ordinances and are responsible and understand we have zero tolerance for any alcohol on the beach,” Tokajer said. The Pine Avenue business district in Anna Maria is also abuzz with visitors. Brian Seymour says sales are up at his Anna Maria General Store & Deli. “The first couple weeks were definitely college kids. This week and next it’s mostly families. It’s nice to see the Island busy again. 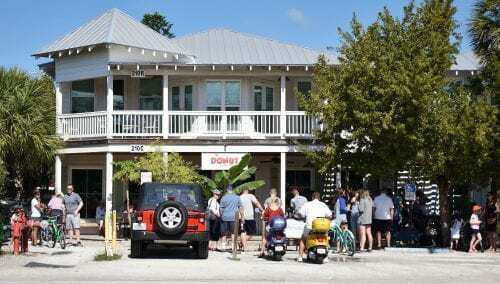 There’s downsides for the residents with the increased traffic, but people have come back to the Island and they’re supporting the local businesses,” Seymour said. “We are having a great spring break. We are much busier than last year. That’s good news and we are renting to families, not college kids,” said Duncan Real Estate owner Darcie Duncan. “We’re having an extremely busy spring break with both vehicular and pedestrian traffic. We’ve got people everywhere,” said Bradenton Beach Police Chief Sam Speciale. “The schools let out a couple weeks ago and we’ll be seeing a lot of people out here until Easter. We’ve got college kids, high school kids and a lot of families coming down. Everybody’s been really well-behaved and it’s been a nice, quiet spring break. You’ve got to give credit to the kids and the families for coming down here and enjoying themselves without causing any problems. The vacation rentals are all filled. We haven’t had a lot of noise complaints, but we’ve had a few. The few we’ve had quieted right down when our officers went there and we haven’t had to go back,” Speciale said. Jake Spooner owns the Bridge Street Bazaar and The Fish Hole miniature golf course on Bridge Street. “It’s been a great 2019 and Easter is later this year, so we’ll have a longer season. I’m seeing mostly families – grandparents, parents and kids. Our numbers are up over last year. The Bridge Street bars have been packed too. 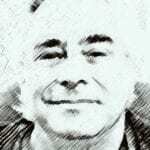 Everybody seems a lot busier this year,” Spooner said. Business is up in Cortez too.